Two more unlike people we could not imagine in our second reading and our Gospel. 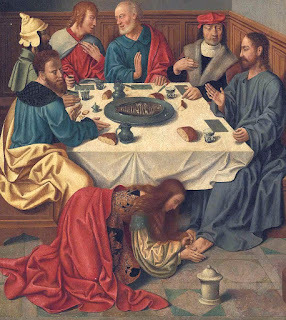 In the Gospel, we have Mary of Bethany, into whose house the Rabbi Jesus was welcomed, who sat at the feet of the rabbi to hear what he had to say, whose brother Lazarus Jesus raised from the dead. Two more unlike people we could not imagine, but one thing unites them both – the self-giving love of Jesus. For the love of Jesus, dying for sinners, without seeking revenge or to save his own life, that he might demonstrate the extravagant love of God to human beings, was for Paul of Tarsus and Mary of Bethany and for all people. And that self-giving love poured out for them called forth from both Paul of Tarsus and Mary of Bethany the self-giving love of each of them. The intelligence and zeal of Paul, once devoted to the destruction of Christians, became devoted to the making of Christians. The love of Mary moved her to pour out a costly treasure upon Jesus’ body, showing care, respect and devotion. One thing unites both these actions – the self-giving love of Jesus. ‘Do you love Jesus’ is not a question I necessarily like to hear or to ask. First of all, I associate it with an overwrought, emotional, demonstrative Christianity. I prefer the historic liturgy, the deep theology, the beauty of ancient music, the restrained, orderly, intellectual prayer of my expression of the church. Secondly, I know my love of Jesus, whether restrained or demonstrative, is far colder than it ought to be. To be asked or to ask, ‘Do you love Jesus?’ is for me to be reminded of all the things which distract me from loving Jesus, or of the times when I’ve kept quiet about loving Jesus because it would make me feel like the odd person out. And yet it is the love of Jesus which is called forth because of the love of Jesus for me. And in the love of Jesus, I am united with all the others who are lost and have been found by Jesus. Last Saturday night, a visitor showed up at our church. She was a Southern Baptist, an education director at a local church, but she had set herself a spiritual project for the year, to worship once a month in a church which was not of her tradition. She was full of questions and extremely respectful. She was a visual artist, and the deprivation of being able to see Jesus, because we cover the images of Jesus and the cross in Lent, affected her deeply. No doubt we worshiped in different ways, had differing understandings of points of theology, expressed ourselves in different ways, but we were united in love of Jesus. She recognized and received the love of Jesus expressed by us in this place. And in her openness to learn and participate with us in our worship, we were privileged to behold her love of Jesus. What a wonderful experience! And yet if either of us had been like Judas, disdaining self-giving love for self-enrichment, seeing the self-giving of another to be sneered at and used for our own benefit, it would have never happened. We would never have been able to come together or be present to each other. How do we show our love for Jesus? If he were here as he was here in the house of Mary and Martha and Lazarus, we might smile at him, hug him or kiss him or kneel before him, greet him with joy as we do with the other people we love. But he is not here as he once was. The words he spoke in the Gospel are true: ‘You will not always have me.’ That is, we have him differently than we had before. True, he is alive, but present with us in a different way. However, we may still love Jesus. Firstly, we listen to his words. This is the first way that Mary of Bethany and Paul of Tarsus showed their love, by listening to him. Paul didn’t really have a choice – Jesus spoke to him on the road to Damascus. But Mary went into the room where Jesus was teaching to hear his words. When we come to the church, we come to hear the word of Jesus, not only in the Gospel, but in the other Scriptures. We hear it in the hymns, we hear it in the liturgy, and hopefully we hear it in the sermon as well. Secondly, we show love for him bodily and for his body. That is a strange way to put it, but I think it’s the right way. For his body is the church on earth. Though Paul never had the opportunity to meet Jesus bodily, he showed his love for Christ when he cared for his body, the Church. When we love each other for Jesus’ sake, we pour out our love upon his body. And of course when we show love and concern especially for the poor, we do so remembering that he said, ‘You always have the poor with you, and you can show kindness to them whenever you wish.’ We know from the Gospel of Matthew that Jesus links love of the needy with love of him. But we want to define the poor more expansively. Not only the poor in body, but the poor in mind and spirit, the poor in social graces, the poor in love who annoy and irritate us and who make our lives difficult. For it is self-interested to love those who love us, but to love the ones who disappoint us and make our lives difficult is only possible in Christ. Finally, we show our love for Jesus when we receive the body and blood of Christ. For when we come to the Lord’s table in faith that he died for us and lives for us, we are united with him and with each other in a mystical way that is beyond words or even our possibility to express correctly. It is beautiful that when we gather for Eucharist we don’t gather at a straight rail, but in a semi-circle, so that we express in the way we position ourselves that we are not coming as individuals, but as a part of a family. This is the last sermon you will hear except for Maundy Thursday, until Easter. The worship in the next two weeks is devoted to telling in Scripture, liturgy and song the story of the Passion and the Resurrection, the self-giving of Jesus in love to the Father and for us. As we hear the words, as we sing and pray, like Paul of Tarsus and Mary of Bethany, we shall be stirred up to give of our own self in love just as he gave himself in love for us.